Trump's Mideast Peace Plan in Limbo as Netanyahu Visits - Integration Through Media ....! 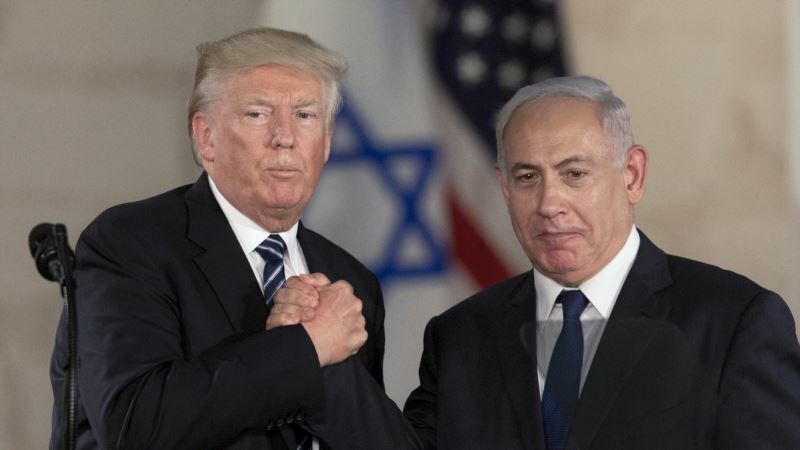 (VOA): There's much to celebrate but plenty of cause for trepidation, too, as President Donald Trump and Israeli Prime Minister Benjamin Netanyahu meet Monday at the White House. For all his talk about brokering the "ultimate deal" between Israelis and Palestinians, Trump's long-awaited peace plan has yet to arrive, even as Palestinians and other critics insist it will be dead on arrival. And although Israel's government is overjoyed by Trump's recognition of Jerusalem as Israel's capital — with a U.S. embassy set to open in the holy city in May — misgivings are percolating under the surface over Iran, where Israel sees Trump's efforts to date to crack down on Israel's arch-enemy as lacking. One major, growing concern: that the United States is acquiescing to Iran's growing presence in Syria and influence in Lebanon — two Israeli neighbors. "If we don't come up with a strategy against Iran, we're going to make Israel go to war here pretty soon," Sen. Lindsey Graham, R-S.C., said Sunday on ABC's "This Week." Swirling legal investigations distracting both leaders at home, and a stunning fall from grace for Trump's son-in-law and would-be peace negotiator, Jared Kushner, have added to the mix of politics, personalities and historical grievances that have always hindered Israeli-Palestinian peace efforts. An already volatile situation now looks even more combustible than normal. Netanyahu arrived in the United States over the weekend as Washington was gearing up for the annual conference of AIPAC, the powerful pro-Israel lobby. He planned to hold a meeting and working lunch with Trump on Monday before speaking at the conference later in the week. Top-ranking U.S. officials including Vice President Mike Pence and U.N. Ambassador Nikki Haley will also address the conference. In a poignant reminder of his troubles back home, Netanyahu and his wife were questioned separately by police for hours on Friday before the prime minister left the next day for Washington. Those interviews were part of an investigation into a corruption case involving the country's telecom giant, and police have recommended indicting Netanyahu on corruption charges in two other cases as well. The Trump family has legal problems of its own. Kushner, Trump's point-man for the Mideast, is under intense scrutiny over his business dealings as special counsel Robert Mueller barrels forward with his Russia probe. Kushner has also been stripped of his top security clearance in another blow to his credibility as an international negotiator. Kushner's peace proposal is near completion, U.S. officials have said, but Palestinians have already written off Trump's administration as a viable mediator following his decision last year to recognize Jerusalem as Israel's capital and move the U.S. embassy there from Tel Aviv. A ribbon-cutting for an interim facility is being planned to coincide with the 70th anniversary of Israel's independence. Israeli Ambassador Ron Dermer, speaking at AIPAC on Sunday, said that the Jewish people will "forever" remember Trump's decision. But while the visit may give Trump a chance to bask in Israel's delight, Netanyahu also comes with serious concerns to raise about the president's broader approach on the Middle East. Israel is increasingly worried that Trump is backsliding on a pledge to "fix" or dismantle the 2015 Iran nuclear deal. Of particular concern is that Trump may push new restrictions to prevent Iran from developing intercontinental ballistic missiles capable of hitting the U.S., but will allow Iran to keep developing medium-range ballistic missiles that could strike Israel. The Europeans have balked at the possibility of medium-range missile restrictions, arguing that existing U.N. resolutions on Iran only focus on longer-range projectiles. U.S. officials negotiating with Britain, France and Germany appear to agree with the Europeans, prompting the Israeli concern. At least publicly, Israel is still giving Trump some political cover, while gently reminding the president that he's long vowed to scrap the deal if it can't be sufficiently strengthened. "I have no doubt whatsoever that this president is willing to walk away," Dermer said.